Back To School Challenge Winner! We'd like to congratulate Bethany Jones, a teacher at Mason Middle School, on winning our Back-To-School Polar Challenge — with her twisty pencil holder design! We like it because it not only is a fun and functional design, but it takes advantage of the crazy geometries that can be made available only through 3D printing! You can find the object here on the Polar Cloud for download and we encourage you to try it out for yourself! We gave it a whirl in our offices, and love having it around! Bethany will be receiving 3 filament rolls for her winning design and we can't wait to see what else she and her students print with it! You may have noticed Bethany and her students on Twitter printing up cool items like a multicolor Mickey Mouse egg, Rubik's Cube Holder, and Golden Snitch! (see photos below) You can follow Bethany and all the cool things her students make on Twitter, @bethany_jones4. As always, you can find the latest updates and challenges right here, or on the Polar 3D Facebook and Twitter page. We'll be announcing the next challenge very soon, so stay tuned! From the article "Iteration and Re-mixing with 3D Printing," in the High School Maker publication. Every week we try to feature the notable examples of 3D prints from the Polar 3D Printer. This week we feature a custom hockey stick handle, a Star Wars Snowflake, and a 4-dimensional Tesseract represented in 3-dimensional space! A 4-dimensional Tesseract represented in 3-dimensional space! The Snowflake Force is Strong! The Polar 3D force is Strong. Yoda and R2D2 printed on the Polar 3D printer. If you're interested in 3D printing, 3D modeling, or design thinking join Polar 3D printers on Instagram. Over the next several weeks, we're going to be publishing 3D prints of the week from users all over the country on our Instagram account. Get ideas for your own creative projects, connect with other 3D print creators to collaborate and share experiences. 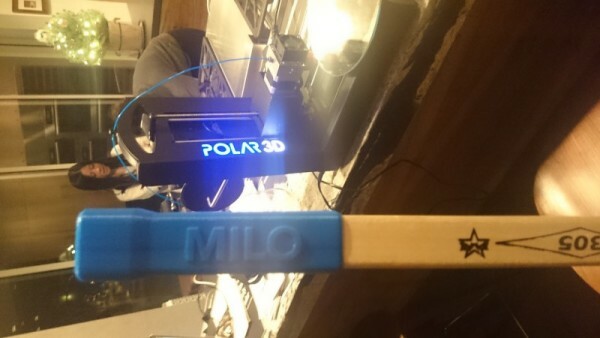 WIN A POLAR 3D PRINTER! In addition, we're having a captioning contest for a recent video that shows thieves breaking into the Polar 3D warehouse and stealing our printers. The most original captions will be judged for creativity, humor and upvotes from social media. But most of all, we want to share all the great and funny designs and experiences that are coming into us from students, teachers and schools around the country.